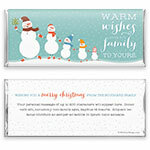 Celebrate the season with a family-inspired candy wrapper, a perfect choice for your holiday wishes. Customize this design to reflect your family by either adding more of, or removing, the snow people of your choosing (just note your request in the special instructions box). Design: Festive snowman and family walking in a winter wonderland. Personalization: Back title and personalized holiday message.